When you need to build new loading bays, the disruption that comes with it can be a daunting prospect for some owners and operators of logistics centres and manufacturing plants. An option that may be an attractive alternative is precast concrete loading bays, suggests Paul Rudge, Area Sales Manager with sara LBS. In a busy place of work any construction activity is likely to have at least some disruptive effect and, therefore, needs careful pre-planning and adaptable real-time management. However, by choosing the most appropriate method of construction, it may be possible to minimise the impact on normal day-to-day operations. 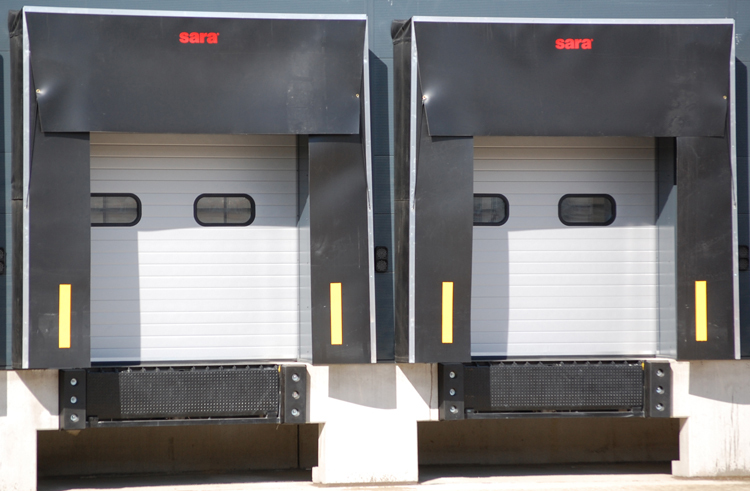 Over its 35 years of installing and upgrading loading bays, sara LBS has come across many tricky situations which it was able to resolve through imagination and lateral thinking. One solution that has been successful on several occasions is the use of pre-cast concrete elements, which are simply delivered to site and manoeuvred into position. Other elements of the build, such as walls, ceilings, dock levellers and roller shutter doors are then assembled on and around them. The result is a compressed building schedule with many of the more disruptive elements of the project, such as excavating foundations and pouring concrete floor slabs, removed from site operations. Perhaps the most unsettling parts of conventional building works for people working (or living) nearby is the foundation laying and concrete pouring. To be economically viable, digging out the foundations on a commercial scale job will require mobile plant such as diggers and dumpers. These will produce spoil, so lorries will be required to take that away. Once these machines have done their jobs there will probably be a need for a small army of builders to finesse the edges, lay reinforcing bars and mesh, erect shuttering etc. Next up is likely to be ready mix concrete lorries arriving on site and pumping the concrete to form the main elements of the loading bays. Again, the builders will follow, checking the concrete works and fixing imperfections. The alternative of precast concrete can remove many of the less desirable elements of such a process. Most obviously there is no shuttering, pouring or curing of concrete on site, and far fewer noisy vehicles. Perhaps more importantly, the time required on site – and therefore the disruption – is very much less. Also, because all the concrete work is done in controlled factory conditions, sara LBS can guarantee full compliance with BS 8110: 1997 (structural use of concrete). Further, time management of the project also becomes much more predictable. With precast construction, little more than deliver time is required. This avoids the variables that must be allowed for casting in-situ, when weather may hold up proceedings, humidity or temperature may slow the cure, there is the possibility of machinery breakdowns, personnel stoppages, late deliveries etc. Very importantly costs and accuracy also become far more controllable, and finally there is less cleaning up required during and after the concrete stages of the project. The finish on precast concrete can be very attractive and more often than not provides the final finish on the job, so there is no need for plastering, painting or other secondary tasks. With the concrete element of the loading bays in place, the project moves on to the next stage of the build and sara LBS can take full responsibility for the rest of the building works including fitting out; installing power, water and other services; interfacing with traffic light controls, erecting bollards, buffers, wheel guides; installing roller shutter doors or curtain doors, dock levellers, etc. sara LBS is also able to look after planning permission and coordinate the whole project from conception to completion. To meet the varying needs of different jobs, sara LBS manufactures precast bays in three standard types which can then be customised with options such as open and closed pit designs, with or without rear retaining walls, etc. Of course, there is a lot of work done off site to prepare for the efficiency on site. This does not involve the client directly, but sara LBS works to the same high standards it maintains for all of its works. sara LBS precast concrete loading bays are cast in steel or timber moulds with various surface finishes options available. All types of fixtures and fittings can be incorporated including nonslip surfaces, threaded sockets for connection of ancillary steelwork, access points for cables, and cut-outs as required. Precast concrete provides a useful option for building loading bays. It is not suitable for every job but can be ideal when say eight or more identical bays are required, yard space is tight or disruption to normal day-to-day operations has to be minimised.